Joshua 3 – It is finally time for the people to cross the Jordan and begin the main campaign of conquest. How many armed soldiers from the 3 tribes on the other side of the river crossed? (4:13. around 40,000 – that’s just from three tribes.) After all had crossed the Lord exalted Joshua in the sight of Israel. They saw that he really was God’s man for them at that time. The priests came up out of the Jordan and then what happened? (4:18. The waters flowed back into flood stage again.) The Lord reminded Israel about the time, 40 years before, when He had dried the Red Sea for their parents. What a magnificent and triumphant day for the children of Israel! They were finally setting foot onto the Promised Land and in a miraculous fashion. It would be a memory they would cherish forever. God wanted them to remember this day always. That’s why He commanded the 12 men to make a monument from stones that had once been under the water of the Jordan. This is a centrally located place in Israel and as the people passed the area in the years to come, they were to point of the monument to their children and explain the significance. God gave two reasons for His miracle at the Jordan. One was that the miracle was an indicator of His great power over the earth. The world was to note that He was One in charge. The other reason was for His own people – that they would see His power and be in fear of the One who could do such things. Many times we think of fear as negative, but the Bible sees fearing God as the most basic belief of anyone follower of God. Look up these commandments about fearing God: Proverbs 1:7, Ps 33:8-11, Ps 34:9. What do these verses teach us about fearing God? (possible answers: fearing God means were are wise, God has power over everything –not fearing Him is dangerous and will bring destruction, fearing God means we hate evil and agree with Him about right and wrong) Fearing God means we respect and honor Him. We know He has control over everything in our lives and we live only by His permission. The Israelites have not been characterized by fearing God up to this point. Their complaints and arguments dishonor Him and show that they don’t believe in His power or goodness. After determining some behaviors and attitudes that show disrespect for God and His power, confess these together before the Lord. [You may want to do this one on one if you have several children] Also, have the children encourage one another by identifying ways other family members do show their respect and love for the Lord. Praise God for what He has done in your life this week and ask Him to help each of you grow in love and respect for Him and His Word. 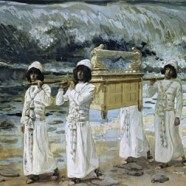 The ark of the covenant of God was kept in the holy of holies in the tabernacle. It was the meeting place between God and man. The blood of the atoning sacrifice was put on the mercy seat which covered the ark. Thus the sins of Israel were covered and the relationship between God and His people was maintained. Update this in terms of the ark as a picture of Christ. Draw a picture of the ark and label the parts. Tell how the ark is a picture of Christ. This should have a profound meaning to you. Does it? Explain. The children built a memorial for their children to see at the place they crossed the Jordan because they wanted to remind them of what God had done. What “Jordan”-like experience do you have to tell others about the works of God? What symbol could you use to remember this (the Jews used rocks from the river bottom). Tell the story of what God has done for you. Shelley Withem currently lives in Anchorage, Alaska with her husband, Ron, and their youngest son, Andrew. She is a dedicated wife, teacher, and author. She is known to all by her love of family, scripture, and most of all her love of God. Thank you for your support! Donations of $20 or more will receive the entire Family Bible Plan in PDF format via email.